iPad. Can I have one even if I had an ihysterectomy? I am sorry, did that title make you feel uncomfortable? No worries, I had that surgery quite a few years ago and left my ovaries which would explain my raging insane menopausal behavior. My title is not as funny as my friend Jessica Gottlieb‘s but then again, she is a rock star and I am not. (and in all fairness, to my knowledge she still has a uterus). But this post will NOT be about my girlie parts. This will be about the abnormal obsession that I, and hundreds of thousands of other Apple geeks have for all things Mac. I have been a MacUser since before many of my readers were out of iDiapers, I am sure. I used to be in the minority but now I am just a semi-cool mom who gets all hot and bothered when that technostud in the black turtleneck, Steve Jobs, comes out on stage to unveil a new Apple product. Today was no different. With 4 windows open on my extra large cinema display I watched a lousy ustream attempt at live streaming and followed the tech specs for the new tablet today as they were unveiled on engaget.com and twitter. 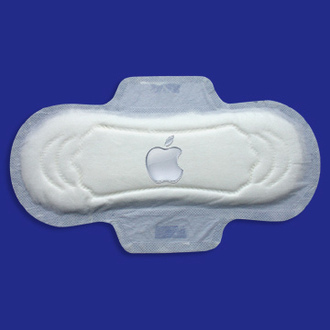 After much speculation about the name it was announced to be the iPad. The photo at the top came across my twitterstream during the presentation. (thanks to Katmanalac). Photoshop users are not only funny, they are fast. You can see what the real one looks like here, and watch the dazzling video about all its features. So here is the story in a nutshell. This is an iPhone on steriods. For those of us who like realtime email and blackberry messenger and hate AT&T we will not have to keep longing for the iPhone anymore. We can keep the blackberry and add this to the arsenol. Personally, I don’t care if I have one device that does it all and these 50-year-old eyes would way prefer to read off a 9.7″ screen than an iPhone any day. The typing looks easier and the ability to read books, listen to music, read newspapers and magazines, view pictures and videos, and surf the web all on one device that I don’t have to squint at is rather appealing. The Keyboard dock got a lot of wows from the audience as it was foreshadowing into what this baby will grow up to be. The fact that is missing a camera is a big negative. If you are not excited by this, you will be by the third generation of this product. You can go bury your Kindle out back with your VCR because this baby blows that dinosaur away! The Apple cool factor is intoxicating as always. I have a strict policy of never buying the first generation of anything tech item because there is always a level of disappointment by the next holiday season when they release the bigger, better, less buggy version of whatever it is. But at the $499 entry level it is hard to not want this toy. Do I think that there is anything revolutionary about this product? Not really as is, but I think that it will be very soon. Although the iBook store, Apples book version of iTunes, will surely blow Barnes and Noble/Amazon and the Kindle right out of the water. And the potential for developers is endless. 1/2″ thin, 1.5 lbs, 9.7 ips display, full multi-touch, 1Ghz apple A4 chip 16, 22 or 64GB flash storage, wifi 801.11n, 10 hr battery, iphone apps work out of the box, keyboard doc and a price point ranging from 16GB with no 3G at $499 to 64GB with 3G for $829 with the big news that although it is still on the dreaded AT&T network there is NO contract. $14.99/month for 250mg data and $29.99 for unlimited. To my parents and inlaws, sorry for this post, I am sure I lost you on ihysterectomy! Haven’t had enough of me yet? You can also read me at 50-Something Moms Blog.For photo enthusiasts, visit Leaving the zip code, photos from outside the comfort zone. The way Mr Jobs looks these days……cancer, liver transplant……I think you guys should stay away from all things Mac…Apple Geeks should take up jogging! Hey “Little Girl” I had an Apple before you could knew it wasn’t something to eat.